Optimizing the page load of a WordPress website is not an easy task. With this tool, I got a 87/100 for desktop, 74/100 for mobile speed and 91/100 for the user experience. There’s room for improvement, in particular to reduce the size of the above-the-fold content. It took me honestly days of iterations and tests to get those results. I could probably have been much faster if I had followed the quite simple steps described below. Note : My website is hosted by a french host named Planet Work on a virtual server with the following characteristics : Linux/Apache/MySQL/PHP, 1000 Mo of cache memory, CPU 1200 MHz. 2) Almost all external ressources (CSS, JS, images, icon fonts) are hosted by a CDN (Rackspace) which is located close to most of my visitors (US based). 3) Images below the fold are not beeing loaded on page load. I use the excellent free Unveil Lazy load plugin for that. 4) Videos in iframes like YouTube or Vimeo are loaded on demand, triggered by a click. I use a the free plugin lazy load for videos for that. Thanks, Nicolas, for your work! And your last update was great, it eliminated need for child theme the almost 100%. I could set all under “Customize”. Also, it is fast! 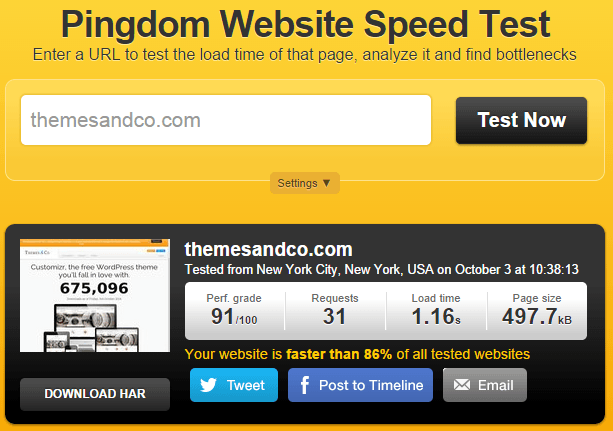 Got 96/90 at second try (just enabled caching & optimizaton plugins). Thanks again – for design, for speed and for listening and implementing features. Hi Ludis, thanks for this much appreciated feedback 🙂 ! I am an Italian web-designer and I created a website using your template theme customizer with my child theme … and I have put a link to your website for credit. thanks for all your hard work! Thanks Umberto, this is much appreciated!